Tables decked with linen make an awesome presentation during events. 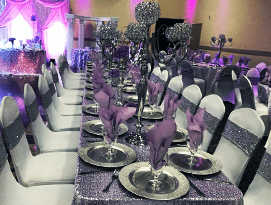 We at Azul Reception Hall, offer you with a vast range of linen to choose from, some of these include- overlays, custom table linens, and table skirts, which comes in various textures, fabric and colors. Linen helps in beautifying the whole environment and hides flaws. Normal tables are made to look grand using our range of Table linen. Come choose from our range and spark up your event. The linen designs that we have, are in abundance, so, you can opt for the one that suits the occasion as per your taste.